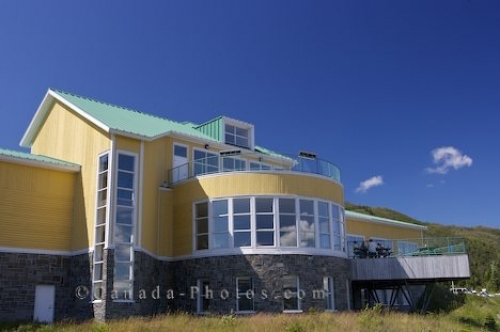 A new addition to Gros Morne National Park in Bonne Bay, Newfoundland is a modernized building which houses the Discovery Centre. Inside the Discovery Centre, visitors can learn about the geology, plants, animals and human history of Bonne Bay in Newfoundland. Gros Morne National Park is already a popular place for tourists but after the Discovery Centre opened, the tourism improved. Inside the building there are interpretative, educational and scientific displays which were funded by the Government of Canada. Located at the south side of Bonne Bay, the Discovery Centre is easy to find with its bright, yellow paint where visitors should plan on spending at least a couple of hours. Picture of the Discovery Centre in Bonne Bay in Gros Morne National Park in Newfoundland, Canada. ... House Brook, Gros Morne National Park, UNESCO World Heritage Site, Viking Trail, Trails to the Vikings, Highway 431, Northern Peninsula, Great Northern Peninsula, Newfoundland Labrador, Newfoundland, Canada.